I know if I wanna start something, I gotta make the first move. Just like if I wanna compile the whole island Hokkien Mee post, first I gotta start hunting Hokkien Mee stalls in the island. Well, let’s start with this Lay Hong Coffee Shop which is located on Macalister Road. It’s a corner coffee shop, where the shop is apparently an old heritage building. This shop caters 2 famous stall, one is the Nasi Melayu and the other is Hokkien Mee which I would like to share with you. This is one of the stall where hubby brought me during our courtship, you know during courting time, the guy will take you to try out all kinds of good food in Penang Island – the hawker delight heaven. The stall has many other adds on for customers to choose, down from stew pork ribs, roasted belly pork, mantis prawns, etc. The soup base is absolutely flavorful, and tasty. A bowl of this with roasted pork belly as add on to the noodle, it gives you some kind of oomph for the morning! It’s authentic, it’s savory, it’s aromatic, it’s delicious, it’s damn good!! Wah! With your write up praise them till so high must test power already. 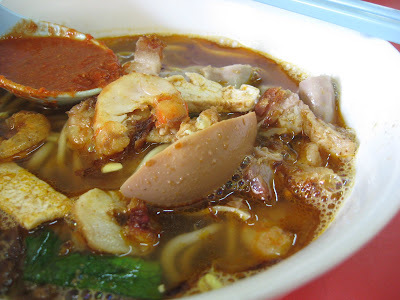 I miss Penang Hokkien mee a lot. should mark this down, as my parents love Penang Hokkien Mee a lot!!! i've not tried this shop, but since so good comment from you, must check it out! 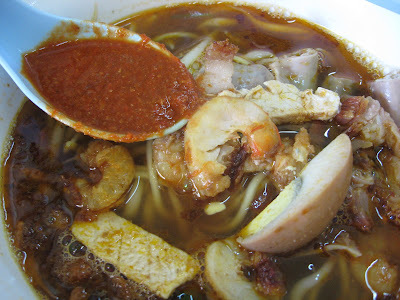 i kinda like penang hokkien mee, or as we Ipohans know it, prawn mee. very different, the broth very sweet and concentrated. unlike the other versions elsewhere. Ooh I believe this is my Dad's favourite stall... I've always been taken with the one at the coffee shop opposite with mantis prawns but now that I've read this, I'm going to give this a try next! oledi salivating at those hokkien mee . 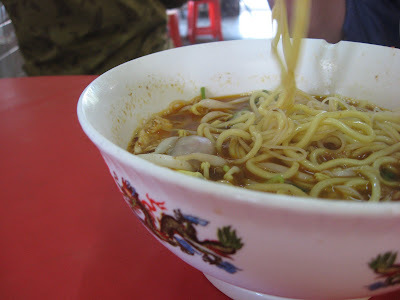 . ."beh ta han" tonight must eat similar mee here in PJ! lol! Thick and luscious looking soup. Though is good and value for money but the mee seems to have a lot of "kee choi" and it spoilt the soups taste.BTW the drinks were expensive. My last hokkien mee was .... can't even recall. A good reminder for me to eat hokkien mee..